Jean Kazez: Are Philosophers Agnostics? This passage from Gary Gutting's recent column at The Stone is misleading, so I must comment! There is no disagreement among philosophers about the more popular arguments to which theists and atheists typically appeal: as formulated, they do not prove (that is, logically derive from uncontroversial premises) what they claim to prove. They are clearly inadequate in the judgment of qualified professionals. Further, there are no more sophisticated formulations that theists or atheists can accept — the way we do scientific claims — on the authority of expert consensus. This conclusion should particularly discomfit popular proponents of atheism, such as Richard Dawkins, whose position is entirely based on demonstrably faulty arguments. 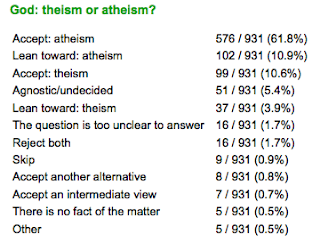 What Gutting isn't letting on is that most philosophers accept or lean toward atheism--a whopping 72.8% according to a recent poll. So if he's right that philosophers don't think the proofs for or against God are sound, he isn't telling the whole story. If that's what the 72.8% think (and it's not completely clear), they don't come to a full stop and declare themselves agnostics. No, they engage in further reasoning (short of proof) so that they end up atheists, or leaning toward atheism. And (of course) they think that further reasoning is good reasoning. And that reasoning may very well be a lot like Dawkins's--which is also short of proof. So Gutting is quite wrong to say that the consensus of philosophical opinion is arrayed against Dawkins. There's no evidence for that. Update (in response to a comment): here are all the details available at the poll website. Is atheism a philosophical position for most philosophers or is more like the fact that most philosophers may be politically progressive? That is, philosophers may have and do have lots of positions on things that they have not thought out with philosophical rigour. For example, most philosophers may prefer science fiction movies to Westerns, but that does not imply that most philosophers are making a philosophically reasoned aesthetic judgment about the subject. Bertrand Russell says that in technical philosophical terms, he is an agnostic, although in conversing with the man on the street, he would call himself an atheist. These philosophers weren't talking to the man on the street--they were participating in a survey of philosophers on many philosophical topics. If you look at the survey, you'll see the full range of topics. I don't believe people answered with "de facto" opinions, but with the views they've arrived at over the years, as a result of various kinds of reasoning (short of proof). Not sure if you'll know the answer to this, but was the survey question offering a dichotomous choice between atheism/leaning to atheism and theism/leaning to theism? Was there an option for agnosticism? And how come the survey has no missing data? Ok, i just figured out you could get more detail by setting level of detail to 'fine'. So there is an option for agnostics and only a minority endorse this. Also, only a small amount of missing data. I guess it raises the question as to whether philosophers of religion are the experts on God! Hi Paul, if you change the "grain" over there you get a lot more results. I added a screenshot to my post. Great minds think alike? Yes, the results for philosophers of religion are very different. Lots of ways to read that! It would be interesting to see the numbers on atheism about others academics of the same socio-cultural level as philosophers to see if the atheism of philosophers reflects their socio-cultural background or is the result of rigorous philosophical reflection. The percentage of non-believers varies from field to field. Philosophers do standardly teach philosophy of religion at least at the intro. level, so it would be surprising if they didn't reason about it, and the reasoning didn't make a difference to their beliefs. If most philosophers teach introductory philosophy of religion, they would most probably have well reasoned ideas on the subject and be fairly up to date on the literature regarding the issue, and Gutting would be wrong.